I have clients who have bought a house in upstate New York. They are a NYC couple who are transitioning their lives to working and living full time upstate and going into the city as they need to. They admired this house from afar, and when it came onto the market a year later, they snatched it up immediately. They are now going through the process of renovating it to become the home of their dreams. Like any renovation project, they are discovering all sorts of issues and dilemmas that are creeping up room by room. This room, pictured above, is technically the third bedroom. They will be using it as their media room. 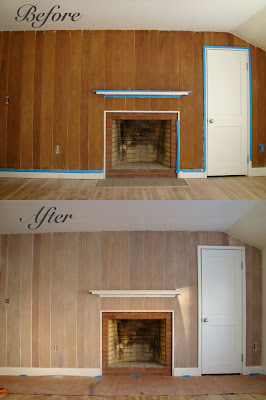 While the rest of the room has sheet rock walls, this one wall with the fireplace is paneled in pine boards. Previous to the 'Before' photo being taken, the pine wall was covered in hideous layers of cracking paint. After going over various options for the wall, my clients and I decided to whitewash it. We had the wall striped with an eco friendly paint remover and then sanded down to 220 grit with palm sanders. From there, I rolled my sleeves up and got started on the Whitewash Project, which is sometimes called Pickling. Please note that this is technically NOT whitewashing. Traditionally, Whitewashing is a process that involves mixing water, lime, and various materials to make a thin paintable plaster. However, there is no technical phrase for the process pictured above. It is generally referred to as Whitewashing. (Confusing, I know!) Below, are the materials and steps involved. Step 1- Prepare the area for painting by laying down a drop cloth or paper to protect the floors. If the trim and baseboard need to be protected, use blue tape to cover them. Also, make sure to remove outlet covers and light fixtures from walls. Step 2- Since someone else removed the old paint and sanded the wall, I went over the wall to inspect it and remove any paint that was left over in the crevices of the panels or along the mantle and trim. I used a chisel to gently scrape some of the paint off. But in most cases, this step will not be needed. The cleaner your wall is to begin with, the cleaner the outcome will be. Whitewashing allows the grain of the wood to be highlighted. So, any imperfections will also be highlighted! Step 3- Go over the wall and quickly hand sand it with 220 grit sandpaper to make sure the surface is smooth and the flecks of old paint are gone. Vacuum the wall with the brush attachment and then take a dry rag and wipe the wall down. It is amazing how much wood dust sticks to everything. Step 4- MIx your Whitewash solution in a container using clean water and interior paint. In this project, I used Benjamin Moore's Aura Paint in Acadia, as the rest of the room is painted this color and we wanted a lighter version of the other walls. Most interior paints and colored wood stains, in flat to satin finish, will work for this application. I used a ratio of 25% paint and 75% water. Always start with more water and play around with the ratios until you are happy with the results. Remember to continually stir the solution throughout the project to keep it evenly mixed. Step 5- Working in small areas, apply the solution to the wall with a paintbrush. As you paint the solution on, have a rag ready to rub the wall and pick up the excess paint. Beware of splinters when you rub the walls! As you move across the wall, you will notice that the solution does not look even due to the wood absorbing the paint. Don't fret! Let the wall dry completely and inspect the results, as it will most likely dry evenly. In the photo above, I did one coat of the whitewash solution. I am happy with the amount of wood grain showing through. As you add more coats of whitewash, the wood wall will become more opaque and show less wood grain. Step 6- (Optional) Go over the wall with steel wool to make the raised grain smooth. This is great. I'll have to spread the word about this option for all that panelling still out there. This looks so wonderful and it is exactly what I want to do for my son's room's wainscotting which I had originally stained the same honey color but want a fresher look...thank you for offering all your how-to's. Now I just have to find the time to tackle the project! It's a great and lovely blog. the looks are so fantastic,thanks for sharing a lovely information about plastic wall panels. can this technique be used on knotty pine kitchen cabinets? Yes! You can definitely use this technique on knotty pine cabinets. The key is to prepare the surface appropriately. Make sure to clean & degrease the wood. Depending on what kind of finish the cabinets have, you will want to get through any top coats. This might mean an overall sanding to rough up the surface to receive the paint, to a full removal of finish. Most likely, you can get away with an overall sanding. Test in an inconspicuous area. I have old wood paneling in my den and its so dark.Would this work on it and would I have to do anything special?